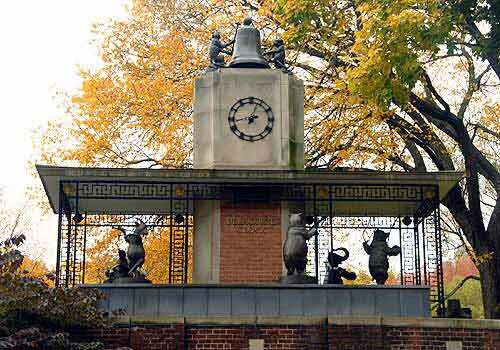 Named after philanthropist George T. Delacorte, the clock brings seasonal chimes and nursery rhymes every day on the hour and half hour from 8:00 am – 6:00 pm. It is one of the most popular features in Central Park. The clock sits atop a three-tiered tower and features a band of whimsical animals: two bronze monkeys banging hammers against a bell; a penguin on drum; a hippo on violin; a bear and his tambourine; a concertina-playing elephant; a goat with pipes; and a kangaroo on horn. The animals circle the tower to one of 44 tunes that change seasonally. Conservancy staff inspect the clock to help keep the clock in good order.